The CSU awards 35 bursaries valued at $650 each academic year. The goal of the CSU bursaries is to help students with demonstrated financial need alleviate some of the pressures associated with the high cost of post-secondary education, and to recognize their academic and extra-curricular achievements. In awarding its bursaries, the CSU takes a holistic approach and considers each applicant’s financial need, academic achievement, extra-curricular activities, and statement of merit. Every reasonable attempt will be made to award bursaries on the basis of gender equity. Candidates are selected by the CSU’s Sustainability Committee, as per the Committee’s mandate to work towards social and economic sustainability efforts, and in accordance with the guidelines set out in the CSU Bursary Distribution Policy. Undergraduate students who have completed at least three credits at Concordia University are eligible to apply for CSU bursaries. Additional eligibility requirements may apply for certain bursaries, as outlined below. 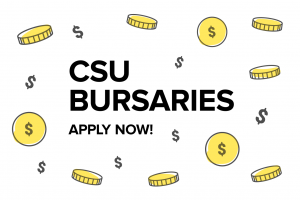 Please note that Councillors, CSU Executives, members of the CSU’s Judicial Board, employees of the CSU, and the Chair and Secretary of the CSU Council of Representatives are ineligible to receive these bursaries. All required documentation must be submitted in order for your application to be eligible. These bursaries are intended to support students who are combining athletic accomplishments and competitions with their regular undergraduate schooling. Both Concordia’s undergraduate varsity athletes and undergraduate students competing at a provincial or national level in their respective sports are eligible for these bursaries. These bursaries recognize students from any faculty who have dedicated substantial extracurricular time to groups, projects, and initiatives that enrich student life at Concordia. These bursaries support undergraduate students who have made significant contributions to an external community off-campus. Individuals who have taken on leadership roles or have otherwise put time into helping a particular community, in Canada or abroad, are eligible for this award. The CSU recognizes that there can be significant barriers facing students who are parents and studying at university. These bursaries are meant to help relieve some of the financial barriers facing student parents. Please submit your application package in a sealed envelope labeled “CSU Bursary Application” at CSU Reception downtown (H-711). Our office is open 10am–6pm, Monday–Friday. The application will be stamped at Reception and delivered to the Sustainability Coordinator. If you have any accessibility issues getting to the location, please email the Sustainability Coordinator (sustainability@csu.qc.ca) and they will arrange accommodation. Submissions are due on March 15th, 2019 by 6pm. You will get a response about the status of your application no later than May 1st, 2019. If you have any questions, you can email the Sustainability Coordinator at sustainability@csu.qc.ca.